Steenbok (Raphicerus campestris) are one of South and Southern Africa’s smallest of antelope but what it lacks in size the Steenbok makes up for in its looks. Being a beautiful reddish brown in colour, male Steenbok only stand between 40-60 cm (16-24 in) high and weight in between 10-16 g (22-35 lbs) with the females being slightly smaller. In comparison to the rest of their bodies Steenbok have very long legs, other defining characteristic of the Steenbok is its very large ears and a black triangular patch on the bridge of the nose. You can further distinguish males from females as only males posses short straight black horns or spikes really which stand about 150cm (6in) in length from the top of its head, large dark eyes, give way to preorbital glands. Steenbok are solitary antelope and only really come together to mate, although breeding does take place throughout the year, births tend to peak in November and December each year which coincides with ‘Mother Natures re-birth’ (Spring) here in the Southern Hemisphere. As with a few African antelope Steenbok are primarily browsers, (pick from trees and shrubs) feeding at or near ground level, occasionally they scrape the ground with their sharp hooves for roots and tubers. Water is not essential as moisture can be taken from the food they eat. 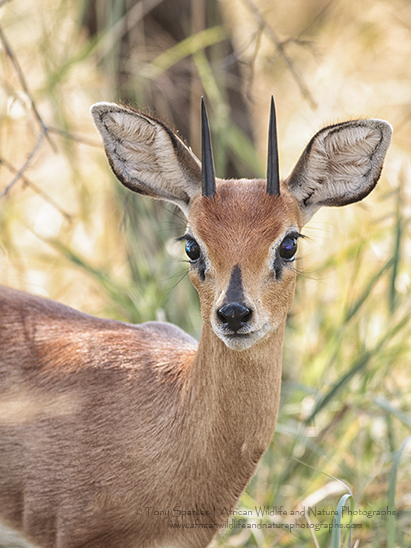 Steenbok have many different predators, including Leopard, Caracal and even Pythons, in the presence of danger, Steenbok first hide, crouching with the neck pressed against the ground and ears retracted to avoid detection. If the threat persists or approaches the animal will flee, with fast zig-zagging flight interrupted by attempts at concealment by lying down flat. In South and Southern Africa the Steenbok’s distribution is wide and varied and can be found in various environments throughout South Africa, Botswana, Angola, Zambia, Kenya, Mozambique, Swaziland, Namibia, Tanzania and Zimbabwe.